An 11-year-old footballer who says boys will not pass to her has been invited to be a mascot for Manchester City in the Women's FA Cup semi-finals. Leyla Priest, from Essex, was upset after feeling boys at training sessions were "blanking" her for being a girl. BBC Essex asked clubs to send a message of support for Leyla, but City responded with an offer for her to lead them out against Chelsea on Sunday. Their last-four tie against Chelsea (15:30 BST) will be live on BBC Two. 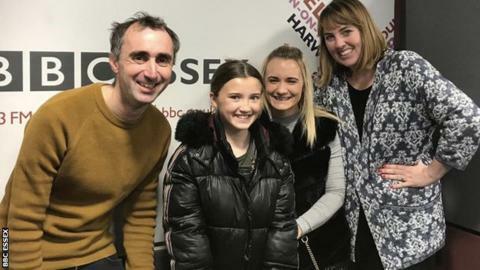 "It felt like I wasn't there, because they just blank me," Leyla, who plays for Hatfield Peverel FC and at school, told BBC Essex. "They stare at me and I'll call for the ball but they just ignore me. "It's probably because I'm a girl. Sometimes I get really annoyed about it." Becky Priest, Leyla's mother, said she had seen her daughter crying after a practice session, adding: "She should be able to play with boys and be treated as an equal. "If she wants to run around on a pitch and have some muddy knees and enjoy herself, whether they're boys or girls on the field, then so be it." Sports broadcaster Jacqui Oatley told BBC Essex: "I was very frustrated when I heard this story about Leyla. This isn't good enough. "It has to be nipped in the bud straight away by coaches, whether they're male or female. "The coach has to spot this a mile off, and the opposing parents and parents of the same team, cannot lot let little boys treat little girls like this. "It's not about gender. It's about encouraging children to get active."